All transactions are safe and secure with a reliable history in online purchasing behind each of our associates. Buy The Punisher No Sweat t-shirt to own Punisher clothing and merchandise. The battle-worn skull on the front of this Punisher tee is a testament to Frank Castle's one-man war on the mob and all criminals in general. This version of The Punisher skull logo offers more of a three dimensional, brazen appearance. 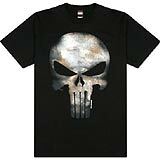 It is a bestselling Punisher shirt and an official product of Marvel Comics. Wear it the next time you feel like grabbing your guns and feeding the mob your ammo. In addition to The Punisher No Sweat tee above, browse the Punisher Clothing Gallery for more apparel like men's and women's clothes, kids shirts or hoodies.